“Ambient Music must be able to accommodate many levels of listening attention without enforcing one in particular; it must be as ignorable as it is interesting.” Brian Eno. At Unit Twelve the radio is usually on, during workshops it’s quietly tuned to classical and participants work to waltzes, stitching and crafting to sonatas, requiems and fugues. During the week the contemporary and varied sounds of 6 Music weave their way into the background whilst the tenants work. Production at Print Garage is always powered by pulsations of propulsive machine funk. Outside, music is everywhere, a constant hum – an aural wallpaper, always available and always growing. Harder, Better, Faster, Stronger. How then do we process this constant stream of music, do we really listen? In counterpoint, as inspiration for new work, the artists at Unit Twelve have taken pieces of music that are important to them, music that speaks directly to them, music that demands active listening and provokes reaction, from singing along and strutting to work to the hushed intimate moments that echo deep within the chambers of their hearts. 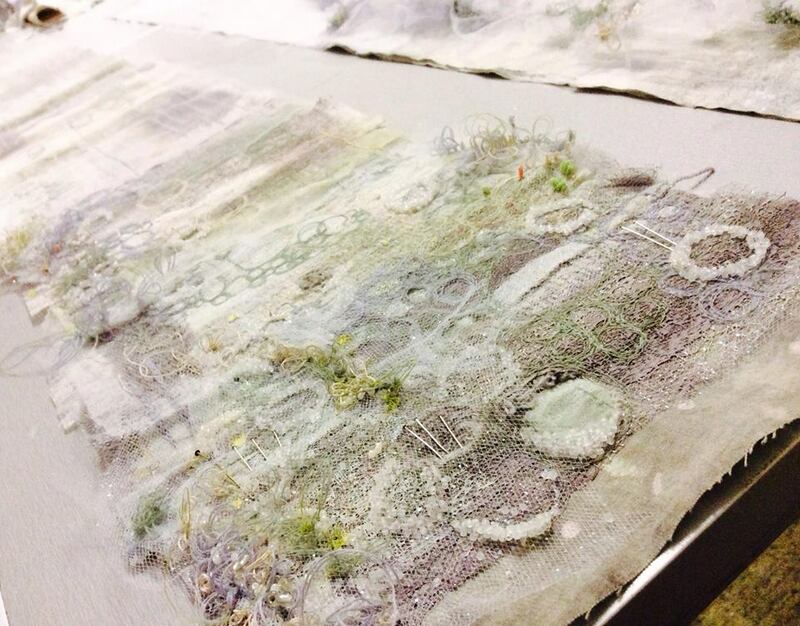 My practice focuses on creating work from paper; by bonding, waxing, trapping and stitching I produce unusual paper ‘fabrics’, which are used to explore the ‘remaking’ of household objects. 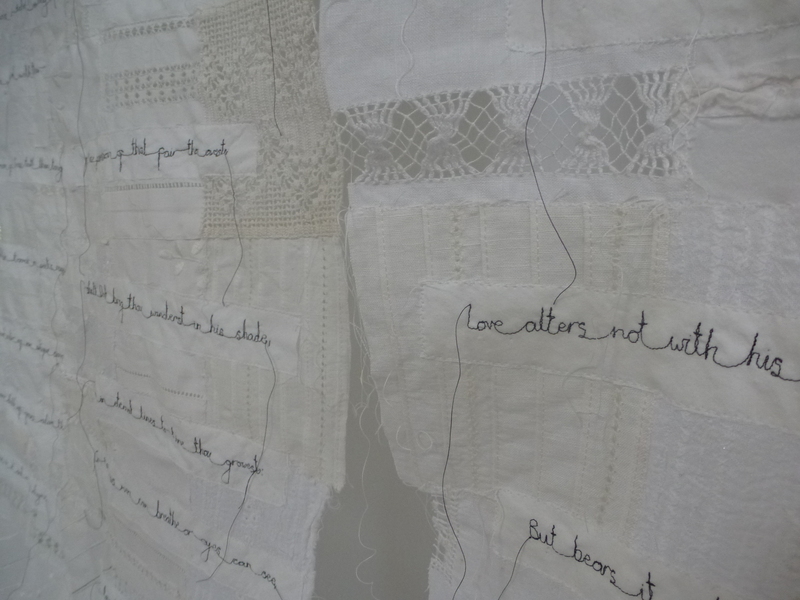 The papers are treated as if cloth, with the main technique employed being stitch; a contemporary twist on traditional textiles. The papers themselves serve as both the inspiration and the media for my work, with the narrative of the books and papers suggesting the forms. I tend to find items then investigate a way in which they can be reused and transformed; giving new life to things that would otherwise go unloved or be thrown away. This exhibition has allowed me to realise my ambition of making a room set created entirely from paper. Using Mushaboom by Lesley Feist, a song very close to my heart (and even read in church at my own wedding); the lyrics provide the narrative for the ‘room’ and inspiration for the objects created. 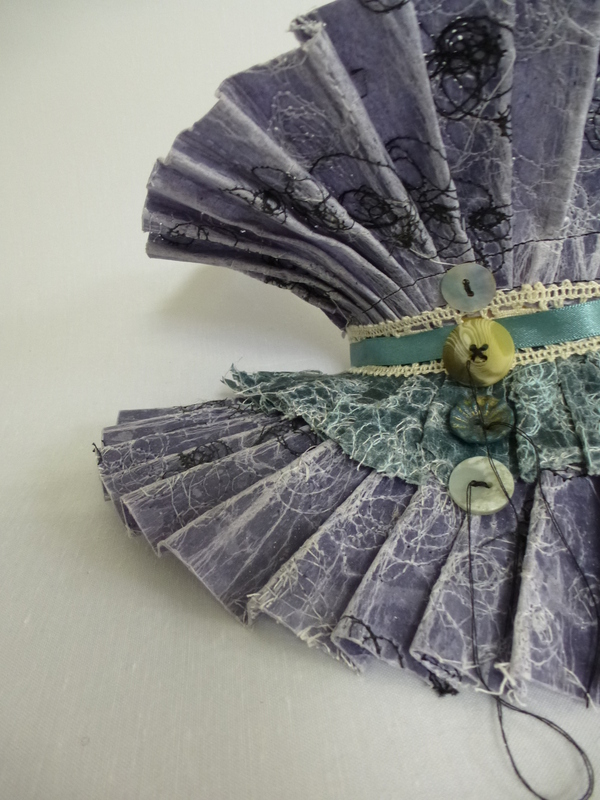 My work has always combined my love for mixing stitch, clay and found objects. I experiment using traditional methods in contemporary ways by working into surfaces and trapping materials to build up interesting layers of tactile fabrics. My work has developed mostly from costal textures and landscapes. 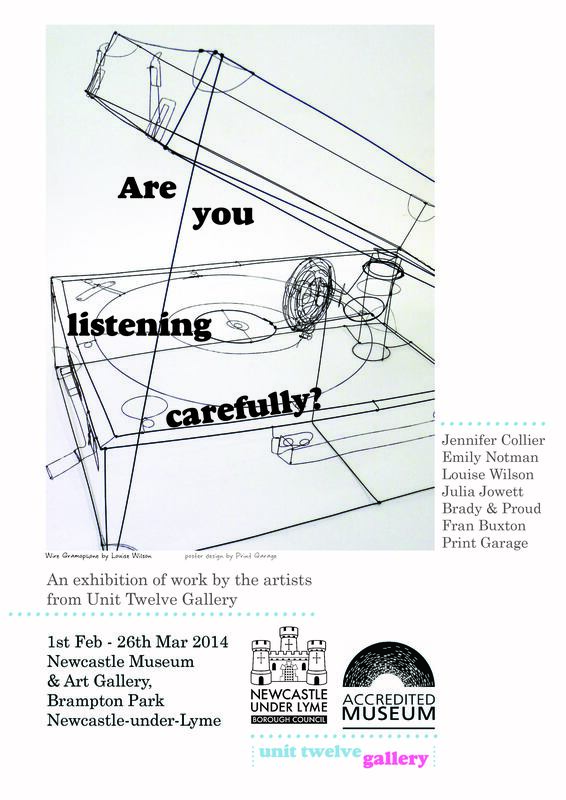 My series of drops for this exhibition evolved from studying the album ‘A Year of Hibernation’ by Youth Lagoon. The album is a portrayal of mental distress in the most beautiful, light and dreamlike way. He mixes genres of music such as electro and dream pop to create atmosphere and mood. It was his contemporary blend of sounds and notes that lead me to recreate this in different mediums including inks, bleaches and dyes. 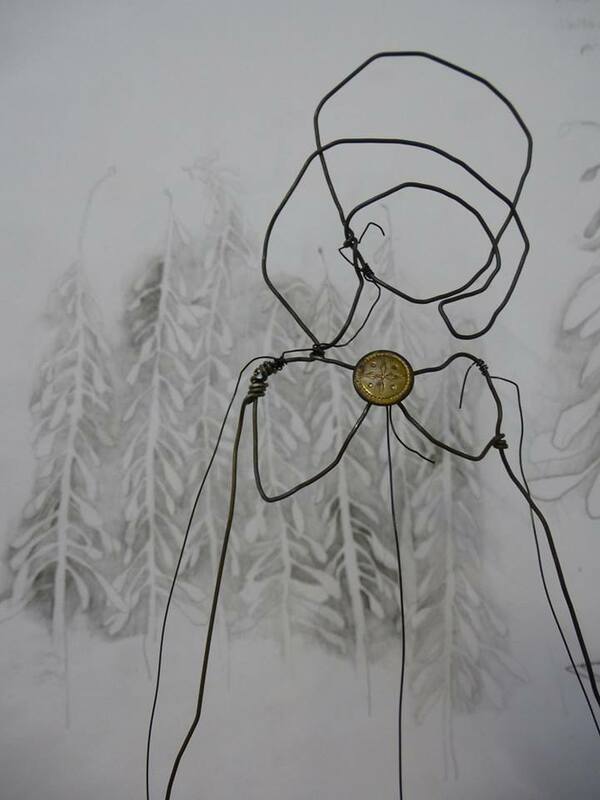 I am a contemporary artist, working with wire, who creates three dimensional wire drawings of everyday objects. 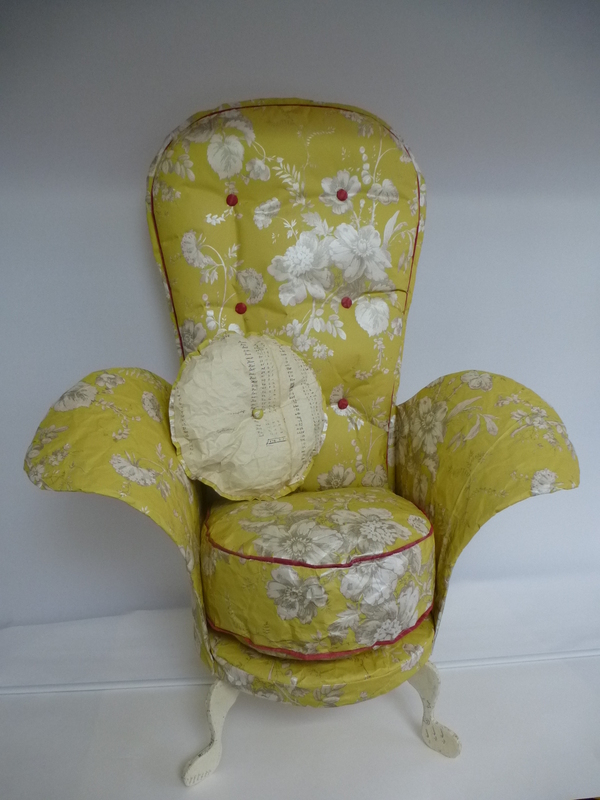 I am inspired by items used in everyday life and the simple yet elegant lines that they have. These lines are often missed and I aim to highlight this simplicity through the use of wire. Are You Listening Carefully? allowed me the opportunity to explore the line of different musical instruments and objects relating to sound, from Recorders to Record Players, with the aim to highlight the special details of them. 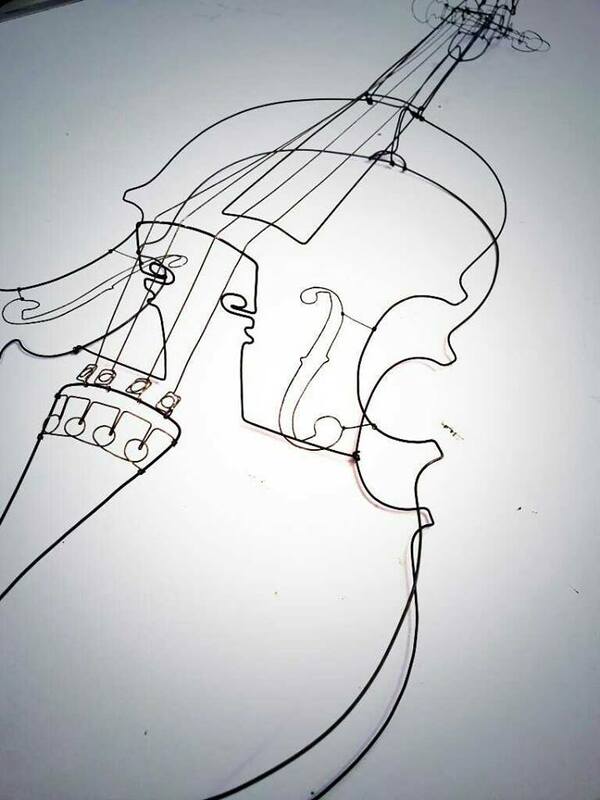 I have been inspired by the elegant curves and lines of a Violin, and the intricate mechanism within the needle and arm of a Record Player and the unique features of music making devices. My illustrative practice explores the importance of storytelling and imagination. I draw with wire, pencil and stitch; intricately working dense areas of traditional embroidery and needlepoint stitches into metal gauzes and figuratively manipulated wire lines. I combine my hand embroidered wire work with observational drawing and screen printing techniques onto fabric and paper to create contemporary art pieces. Drawing on folk tales, childhood stories and surreal imaginings, I harness instinctive feelings and traditional craft processes to create considered folkloric narratives that intrigue. Coming from a large creative family, Brady & Proud are sisters with a life long passion for making. 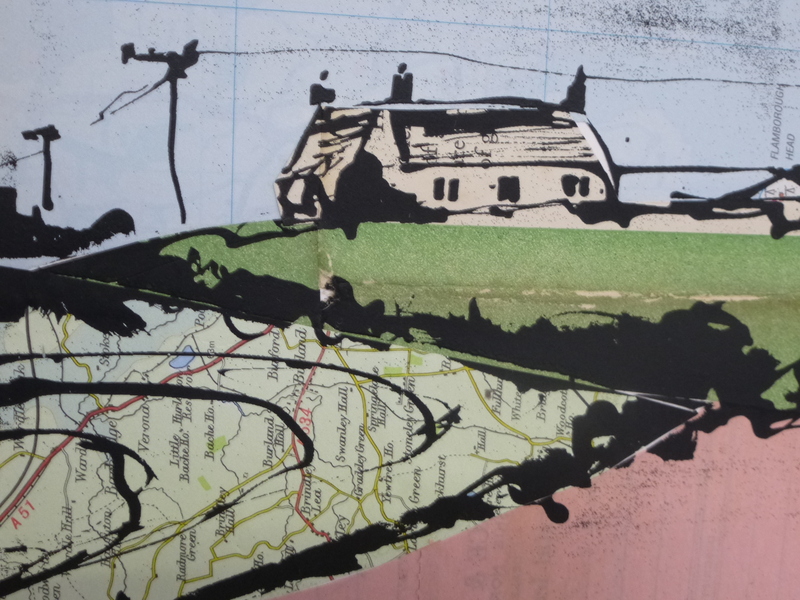 Having studied Illustration and Surface Pattern, Sally’s chosen medium is screen print. With no formal training Ruth’s natural affinity is with the sewing machine, in particular using it freehand as a drawing tool. Although their work is very different they are united in their appreciation for the beauty found in simplicity and their passion for vintage and re-cycled materials, with all the marks and flaws that betray their previous life. If you want I’ll take you there. “The piece of music I have chosen in response to this theme is ‘Shakespeare’s Sonnet No.18’, sung by Bryan Ferry. This piece of music takes me to the moment when I first realised my own mortality and appreciated how fragile life is. My current practice is an exploration of found, created textures and surfaces. Using stitch, embellishment and manipulation techniques, with a little experimentation along the way, previously pedestrian materials are transformed to have depth and intricacy. This body of work is inspired by music on the stage, particularly the rich array of opulent costumes in ballets, operas and musicals, and how these hypnotise the audience just as much as the music. This has translated to a series of decorative, semi-functional pieces which capture the splendour and diversity of the show. Print Garage is the dark and dusty underground lair of Iain Perry: self-styled, swashbuckling squeegee warrior. 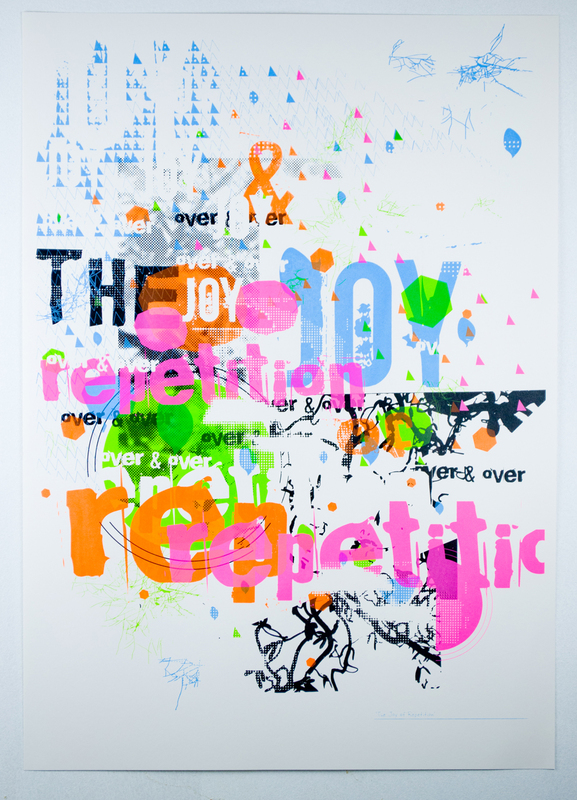 “I create vibrant screen prints investigating the minutiae of my surroundings. I draw inspiration from old technology, tools and toys, cinema, record sleeves and the world of science. actress, andrew weatherall, andy stott, aphex twin, arthur russell, arthur william edgar o’shaughnessy, blondes, boards of canada, burial, carl craig, christopher rau, claro intelecto, dabrye, danny norbury, dj koze, falty dl, feist, floating points, flying lotus, forest swords, four tet, gerry read, gilles peterson, gil scott-heron, graze, hauschka, hercules & love affair, james holden, holy other, howes, james blake, jesse lanza, john roberts, john coltrane, jon hopkins, john talabot, the juan maclean, kassem mosse, kyle hall, lcd soundsystem, letherette, mark e, marvin gaye, moomin, motor city drum ensemble, mount kimbie, nils frahm, omar s, the orb, penguin cafe orchestra, pharoah saunders, ricardo villalobos, segue, shed, sun ra, theo parrish, thomas fehlmann, to rococo rot, two lone swordsmen, ukkonen, vampire weekend, vangelis, voices from the lake, a winged victory for the sullen.